‘Where are the billions of pesos in rehab funds?’ . 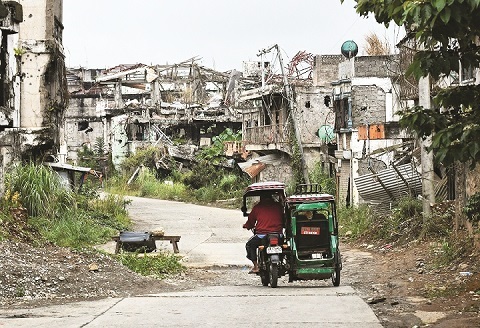 NEARLY two years since the Marawi siege, tens of thousands of residents continue to engage in a battle but this time, due to poverty and neglect. Lives of Maranaos are far from normal as half of the pre-siege population have yet to return to their homes. Many are wary if they could even step again in the land that they and their families have inhabited for years. This was the picture that “Otso Diretso” senatorial candidates Samira Gutoc and Erin Tañada saw in a visit to “ground zero” last week. Ground zero is the site in Marawi that was literally reduced to crumbles following the fighting between the military and the group linked to international terrorists. Gutoc, who is from Marawi, and Tañada echoed the residents’ question: Where is government’s promised help? In a press statement sent to this paper over the weekend, Gutoc and Tañada also said martial law currently in place only created a climate of restiveness among the Marawi people instead of peace. “Marawi is the symbol of all the wars done to us,” Gutoc said. She lamented what she called as the slow rehabilitation and the lack of consultation with the people on how their city would be rebuilt. Gutoc also demanded transparency on how the billions of pesos in funds are being spent for the war-torn city. “There should be transparency on the spending. Where are the donations for the people? Where is the rehabilitation?” Gutoc asked. Tañada said nearly two years after the fighting, the government is just into the groundbreaking rites that signal the start of revival of ground zero. “The people should be consulted every step of the way because this is their community, their life,” Tañada said. He added that billions of pesos have been poured into the rehabilitation plan and it is time the people see something concrete. “Habang wala silang tahanan, trabaho, at maayos na kabuhayan, lalo silang nalulubog sa kahirapan,” Tañada said. “Kung gusto nating wakasan ang rebelyon, tugunan natin ang kahirapan, ang kawalan ng lupa, ang pang-aapi sa Moro at kawalan ng trabaho,” Tañada added. Next Superstar kicks off the Summer with S.O.A.K.